Earlier on our website, we have discussed that from where we can Buy Excalibur Dehydrator Online on your Country. But do you know that Excalibur is one of the oldest and famous brands﻿﻿ that manufacture food dehydrators from past 43 years? People who are using this brand are not only impressed by the features which it offers, but they also use the products of this famous company due to the reliability which they get in return. The company “Excalibur” has always tried its best to introduce developments and innovations in the field of food dehydration. The maximum number of dehydrators of this brand manufactured in the USA with a passion for providing best quality product to its buyers. ​Do you know that what is the main motto of “Excalibur Company”? Well! The company manufactures food dehydrators to save your food from getting wasted, save your time which you might have to spend while using another mode of drying and also your money that you need to spend on your food bills. Excalibur dehydrators are tremendously resourceful that could be easily used at your home. You can preserve vegetables, fruits, as well as herbs rapidly and effortlessly in these dehydrators. If you are fond of creativity in your kitchen, then the Excalibur dehydrators will surely help you in making pet treats, fruit rolls, healthy snacks and yogurt without adding any additives, preservatives, fillers and excess salt. In fact, you can also make home crafts in such appliances. Yes! You read it right. The potentials of “Excalibur dehydrator” are endless. 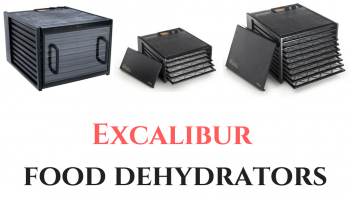 In below article, firstly we will discuss and review about the top ten Excalibur dehydrators. Besides the list, we will also let you know more about this world famous brand and why you should go for it. Since “Excalibur” brand is one of the oldest names in the segment of food dehydrators, it is quite obvious that you will find lots of models in the market. Thus, to help you more, below we have listed the top ten best Excalibur dehydrators by features, pros-cons, and customer benefits. Why Choose an Excalibur Dehydrator? How to Use Excalibur Dehydrator Other Than a Raw Food Dryer? How Will You Benefit from Buying an Excalibur Dehydrator? How Is an Excalibur Food Dehydrator Superior for Living Foods? The top name in our list is of Excalibur 3926 TB which is undoubtedly one of the most innovative electric food dehydrators that are obtainable in the market at present. This appliance offers numerous outstanding features as well as outcomes of a superior quality to its buyers. It also comprises of the most important characteristic like an adjustable thermostat as well as an automated timer which makes it a worthy investment for a customer. You can cook amazing delicious dried snacks with this product by maintaining a healthier lifestyle. There is lots of space in the trays space which works amazingly during the peak season of food processing or for the heavy users. It also comprises of the feature of adjustable temperature control that could be adjusted according to your requirement. A timer along with the automatic shut-off feature is available which allows you to leave your appliance unattended if required. It can easily accommodate tall and thick food items by just taking out the upper trays for space expansion. The cost of this food dehydrator might be more expensive than the food dehydrators which do not have a timer. It creates little noise while functioning. There are no solid sheets provided along with this appliance for drying drippy foods or for making fruit leathers. The controls of the machine are situated on the back side that might be little inconvenient if the appliance is placed on the counter below cabinets. The Excalibur 3926 TB is a good machine for heavy duty consumers or persons who do hunting or gardening. Some of you might find its cost little high as compared to the other dehydrators. But if cost is not your main issue and you want a superior food dehydrator having a large capacity along with best features then, you must seriously consider the Excalibur 3926 TB. There are very fewer drawbacks about this product which can be cover up with the advantages which you will get I return from this appliance. The next name in our list is of Excalibur 3900 B 9 Tray Deluxe Dehydrator. This machine is one of the best professional dehydrators available in the market. It is entirely suitable for both i.e. experienced as well as novice users. You can easily love your favorite vegetables and fruits right in the luxury of your home. After buying this machine, you do not have to worry about buying fruit leather, fruits rolls or dried vegetables from the market. When you have this appliance at your home then, you can just evade the toxins and chemicals which are found in store-bought dehydrated food. This machine is quite easy to clean as it consisted of the trays that do not need much time for cleaning and you can wash them in a dishwasher also. It comprises of an adjustable thermostat feature with you can adjust the temperature rendering to the category of the food items i.e. meat for jerky or fruit sauce for making fruit leather. The mechanism of horizontal air flow helps in drying out the food items much quicker. There is no need of rotation of the trays in between the process of drying. The trays of food dehydrator are unbreakable due to the polycarbonate material. In fact, it can handle the weight of more than 30 pounds. This product is the little bit noisy due to the sound created by the fan during the process of food dehydration. You will not find any timer in the Excalibur 3900 B dehydrator, and that is why there is no option of auto-off. This machine is quite bigger in size which makes it best suitable for the large families. This food dehydrator is considered to be one of the finest dehydrators in the market. It is a fast, safer and easy to use the machine and almost packed with the features which you need in your drying machine. You can also use it for many purposes i.e. for making household treats to crafts such as potpourri. Once you buy this machine, you will surely realize that it is a helping hand in your kitchen. The Excalibur 2900 ECB 9-Tray Economy Dehydrator is one of the reasonably priced appliances that you find in the market. 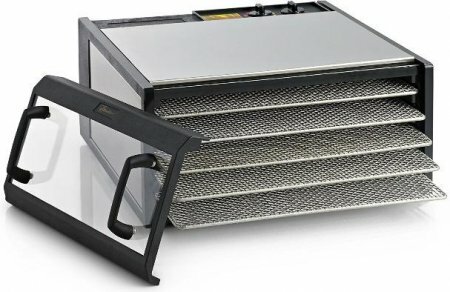 As you know that Excalibur is a renowned dehydrator company having an outstanding reputation, and this 2900 ECB 9 tray model is the highest seller on the numerous online shopping websites. One main disadvantage about this product is that it does not have a timer. However, if this is not your primary consideration, then you can buy this product for availing numerous benefits of drying fruits and vegetables in bulk. It consists of 9 full-size trays which offer around fifteen square feet of dehydrating space. The feature of adjustable temperature control benefits in drying an extensive variety of foods. It is a multipurpose product whose trays can be taken out for making room to accommodate big size food items. This product belongs to the Excalibur brand which is a well-known name having a status for excellence and sturdiness. One of the main disadvantages about this product there is no timer. If you want to buy solid sheets for preparing fruit leathers or handling liquids, then you have to purchase it separately. The controls are also situated at the back side of the appliance over the top, and that can be hard to reach there. This machine is a good option for the person who wants to buy a large dehydrator but without the feature of a timer. However, it comprises of an adjustable thermostat function which is one of the most significant features for efficient drying of all diverse kinds of foods. As its name suggests that this is an economical appliance that you can buy. It is also the most efficient and reliable devices amongst its similar models. If you do not have any issue of space and also not concerned about the timer, then you can invest in this high-quality and comprehensible food dehydrator. The Excalibur 3526 TB is a useful and expert-grade appliance which is specially designed to benefit you in enjoying the several advantages of dehydrating your vegetables and fruits. It is also a good asset for any home that has fussy children. It means you can make your kids love with fresh fruit and vegetables with the help of this appliance. In this machine, you can cook many batches at the similar time that can ultimately help you in saving your precious time as well as money. This appliance is a superb horizontal dehydrator and also suitable for the small family. It is quite easy to set up this machine on your countertop or kitchen. It is one of the fastest and proficient dehydrating machines. It performs its functions quite silently. You will get a 26 hours timer in this product which can help you a lot if you have a busy, hectic schedule. The trays of the appliance are easy to get the break. There is no room for adding any extra tray. The lower range of the adjustable thermostat feature is not appropriate for certain food items. Taking everything into account, the Excalibur 3526 TB can be a good investment for the people who can pay for a high-quality food dehydrator. The machine comprises of all great features which will surely help you in loving the benefits of food dehydration. Apart from the appliance itself, you will also get a recipe and instruction booklet which will guide you in using this machine appropriately. Through the appropriate care, this machine can assuredly last for several years. 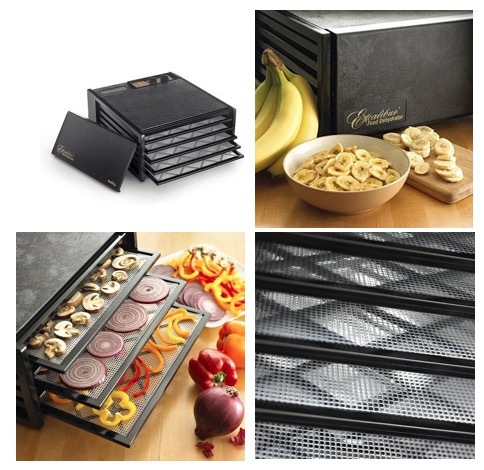 Excalibur 3500 B 5 Tray Deluxe Dehydrator discovers the healthiest method to preserve healthy foods. You can also adjust the temperature of this appliance with the help of adjustable thermostat according to your need. The 8 sq. ft. Space of the trays is sufficient to dehydrate adequate food items. The horizontal air flow structure allows you to dry any food items very rapidly. It’s inbuilt ON and OFF switch benefits in controlling this dehydrator machine effortlessly. Since all its features are user-friendly, you can easily use and monitor the dehydrator. You can control the temperature of the appliance according to your need with the help of adjustable thermostat feature. It consists of the system of horizontal air flow which is a unique feature that helps in drying all the food items quickly and efficiently. You do not have to rotate the trays in between the process of dehydration. It consists of enough drying space that you can use to dehydrate enough quantity of food at one single point of time for a smaller family. This machine is quite easy to clean, and this saves your lots of effort and time. The five trays of this food dehydrator are small in size which is not suitable for the family that has a large number of members. The appliance is somewhat noisy. Thus, to avoid any awkward situation you can use it in another room. 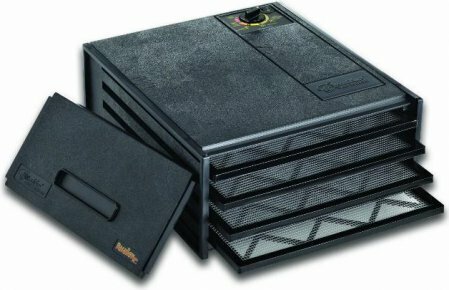 Excalibur 3500 B 5 tray deluxe dehydrator lets you dry out the diverse variety of food items in the most reasonable ways. You will get the best highest specifications if you buy this ultimate electronic machine for your home. It provides excellent reliability and ultimate resourcefulness to any buyer. The manufacturers of this appliance also offer you a guarantee of safer usage. You can prepare amazing healthy dishes for your kids and family members without any hassle by using Excalibur 3500 B.
Let’s come to the next name in the list i.e. Excalibur 2500ECB 5-Tray Economy Dehydrator. As you are aware now, that dehydration is the easiest, healthiest, and most inexpensive technique to dry and preserve foods. Therefore, this appliance also offers you the same benefit in a more stress-free way. You just have to load its trays as well as set the required temperature in this Excalibur model and rest is going to be done by the dehydrator itself. It dehydrates the food contents of all trays uniformly, so the whole thing was done at once. The natural flavor, sugariness, and fragrances of your food also remain the same after drying in this machine. It also offers you 8 square feet of dehydrating space which are impeccable for the smaller families. There is lots of space on the trays. The feature of adjustable temperature control is also present which benefits you in dehydrating any food item. A timer along with automatic shut-off option also given. It perfectly accommodates the tall and thick food items. The price of the Excalibur 2500ECB is little costly as compared to the other available similar models. It creates slight noise while drying out food. You will not get any solid sheets along with this machine for making fruit leathers or drippy foods. You have to buy it separately. The controls of this machine located on the back side which can be quite problematic if an appliance is placed on the counter below cabinets. The appliance is bulky to move. Along with the power capacity of 400 watts, the Excalibur 2500ECB 5-Tray Economy Dehydrator is perfect for dehydrating any kind of food i.e. either fruits, meat or vegetables. Owing to its wattage power, you can easily and rapidly dry lots of food in very short span of time. One main weakness about this product is that it is somewhat bulky to move alone. However, if you keep this product with proper care, then it can be used for many years without any trouble. The manufacturers also offer ten years warranty on this product which is also the main highlight for any buyer. Excalibur 2400 4-Tray Economy Dehydrator is a mid-range machine that you can buy. It is perfect for any person who wants to spend some money in availing the extra features of dehydration. This particular model benefits you in just avoiding the additional salt, toxins, and chemicals which you found in store-bought dry food. When you buy this machine, there are numerous diseases and health conditions like obesity and elevated blood pressure that could be avoided. In fact, nowadays, various nutritionist and dieticians recommend using this appliance for your better lifestyle and health. The Excalibur 2400 originates with 4 mesh trays which are very easy to clean and it also keeps your food away from falling on the other trays. The trays are made up from the poly screen material which is appropriate for drying out light elements like flowers and herbs. It creates very less minimal noise as compared to the other models because of the lower wattage and smaller fan. The control of temperature in this machine is not reliable, and you find yourself expending the maximum setting for all of the food. It is not suitable for professional cooks or chefs owing to the less quantity space for food. It is not appropriate for large size families that have more than four members. The appearance (shell and exterior) of this appliance is cheap due to the plastic material used. The Excalibur 2400 is not a much expensive and a small size machine. But you can use it as a starter model or for an irregular use device. You can also say that it is a great exploratory device. The unreliable temperature control is one of the major flaws about this machine, but it does dry out up to the same level that requires as per the industry. If you have a smaller kitchen, then you must go for this Excalibur food dehydrator for sure. The Excalibur EXD 900W 9 Tray Dehydrator originates with nine trays as well as with a total drying space of 15 square feet. 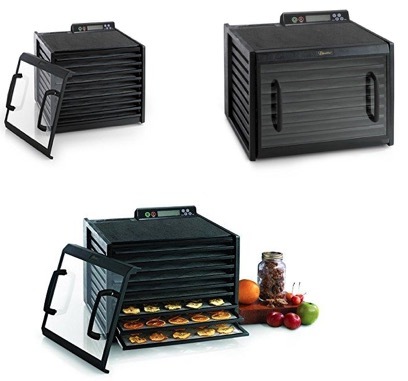 The main benefit of buying this product is that it comprises of an adjustable thermostat feature that can control the temperature between 95 degrees F to 155 degrees F. It means you can dehydrate not only fruits and vegetables but also the hard meat like jerky. The heating element, fan, and thermostat all are located on the back side of the unit which means the cold air entered, heated and then dispersed uniformly over every single tray. 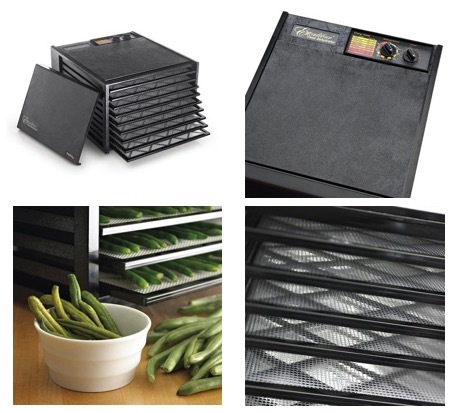 There is lots of space that is available for drying in Excalibur EXD 900W food dehydrator. The food dried in the machine could be preserved for many days without issue. The feature of adjustable temperature control id given in the dehydrator for drying out ant category of food. It also comprises of Excalibur's Parallex Horizontal Airflow which helps in dehydrating the food faster, holding more nutrients and taste incredible. There is no need to do the rotation of trays as all the food gets dry out evenly. The trays are sturdy and quite easy to clean. There is no timer given in the appliance, so you have to buy an additional timer if required. The size of the machine is bigger which needs a lot of space in the kitchen. The machine is also the little bit noisy due to the sound made during the movement of air. The drying of food items like tomatoes can be messy so you have to buy extra non-stick dehydrator sheets for this machine that can be a great help. An Excalibur EXD 900W 9 Tray Dehydrator dehydrates better, quicker and safer due to the Excalibur’s patented technology of Hyperwave Fluctuation. Usually, a standard food dehydrator yield unchanging and constant heat which can result in “case hardening," but this does not happen in the case of the Excalibur EXD 900W. The Excalibur’s Hyperwave Fluctuation technology results in the fluctuation of the air temperature that evaporates the moisture of the food. So, if you are looking for a hi-tech food dehydrator that includes decent features at nominal cost, then Excalibur EXD 900W 9 Tray Dehydrator will be a good option to buy. 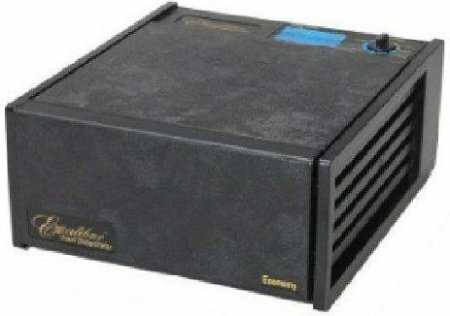 The Excalibur 3948CDB 9 Tray Food Dehydrator is one of the recently launched dehydrators in the market which consists of a unique new dual feature of timer and temperature controller. 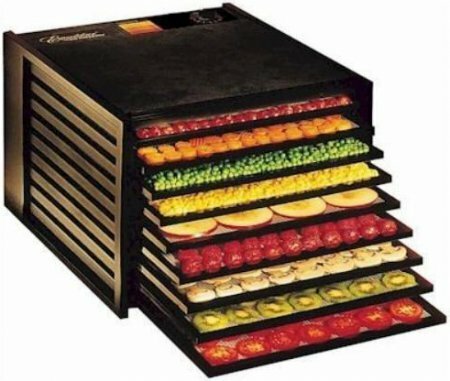 This 9-tray food dehydrator encumbers with all the finest standard features but along with some new innovative ones i.e. a 48-hour timer, a clear door, as well as a pristine digital controller which offers you the choice of setting two time periods at two diverse temperature settings. All these cool features might add up to the overall cost of the product. After buying this product when you get new features in this dehydrator, then you will realize that spending on buying Excalibur 3948CDB is quite worthy. There is plenty of space for trays, and the size of the machine is right for recurrent and heavy users. The feature of adjustable temperature control helps you in processing all categories of foods i.e. from subtle “living food” items to hard item like meat. There is new dual control timer along with the alternatives for setting two sequential time periods at two different temperatures. An automatic shut-off feature is also available for the convenience of the buyer. The door of the dehydrator is transparent for seeing the foods processed during the process of dehydration. The door is detachable for more suitability during the cleaning and loading of the food. You can remove the trays for placing the tall jars and large foods or craft items inside the machine. A book named “Preserve It Naturally” is also given along with the product for much more thorough information along with the recipes. The cost of the Excalibur 3948CDB is pretty much higher than the other obtainable machines. You have to buy the solid tray liner sheets distinctly if required. The controls of the machine are located on the back side which can be quite convenient while using the food dehydrator. Even, if this product is launched recently in the market, but still it's gaining lots of popularity among the people. The name "Excalibur" which is famous from past several years for its reputation and brand image have again shown a miracle in the form of this launching. As compare to the other model's features, this machine has just beaten them up. The transparent door along with two-time temperature control has appeal lots of people towards this product. We just want to say that if you are searching for a significant size capacity and a multipurpose food dehydrator which loads with exceptional features, then the Excalibur 3948CDB 9 Tray model is a perfect choice. The Excalibur Dehydrator 5-Tray Clear Door Stainless Steel w/Stainless Steel Trays has been perceived to be very dynamic and efficient. You can wonderfully dehydrate food in this appliance without any difficulty. The dried fruits and vegetables offer you great nutritional and healthy values in return. When you use this machine, you not only save lots of money but also make the lifestyle of your family healthier. It is quite worthy to buy this food dehydrator if you want to make a good investment for your kitchen. The food dehydrator provides the right way to preserve food as related to the canning or freezing. The sleek look of the machine offers a classy look to the kitchen. The food dehydrator helps in saving food and making tasty, healthy food snacks such as dog treats. The low-temperature dehydration of the machine does not eliminate the enzymes of the vegetables and fruits. An instruction booklet also provides along with the appliance which acts as a guide to see exactly how much time is required to dry a particular food. The 5 tray offers lots of drying space for dehydrating food for small size families. Steel shelves ensure that the foods do not stick. The appliance is not easy to clean from the base as it does not have any sheet for collecting the leftovers and particles from the dehydration procedure. The fan of the machine sound could be heard after some time. It is not irritating, but your family members can hear during the silence in the home. The Excalibur Dehydrator 5-Tray Clear Door Stainless Steel w/Stainless Steel Trays is one of the best dehydrators that you can buy from the market. The sleek outlook along with a transparent door and a stainless steel body make this machine quite popular among the buyers. It also offers an elegant look to your kitchen. Anyone who wants to make a sensible investment must go for this product that can serve you for the longer period. 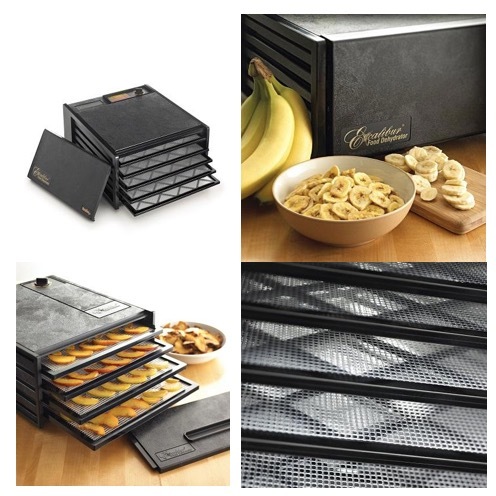 The Excalibur dehydrator is available in numerous sizes i.e. 4, 5 or 9 trays. As per your requirement, you can choose the appliance which suits you the most. The Excalibur Company's products (such as food dehydrators) need very less electricity. It means they cost around 5 cents per hour for drying the whole quantity of food. They are pretty much cost efficient appliances that you can opt. It becomes quite easier to place large size food items in the dehydrator if its doors and trays can be detached. So, this benefit you can avail in the Excalibur dehydrators which help you a lot during the cleaning or filling inside the appliance. If your dehydrator has a feature of temperature settings, then you can still keep the good bacteria alive inside the food during the dehydration process. Thus, there are several Excalibur food dehydrators which comprise of this fantastic feature that you can buy. As you know, Excalibur dehydrators are one of the oldest and renowned food dehydrator brand that is available in the market, and this is the reason that makes this brand so popular. In fact, you can only search the word "Food dehydrators" in your Google search engine, and it will just direct you towards the "Excalibur" product. The company has an excellent track record from past several years, and it is still providing its valuable services to the people. It is a misconception in the mind of people that a food dehydrator can only dry out fruits or vegetables. But this is not a complete truth in the case of Excalibur food dehydrators. If you are thinking of buying an Excalibur dehydrator, then you must know that its uses are far beyond the normal use. Have you ever made nut and flax seed crackers in a food dehydrator? Not yet? Then don't worry as Excalibur dehydrators are here. You just have to blend up some batter and transfer it over the tray inserts. Just wait for few minutes, and you will get a bunch of your personal raw crackers. Have you got a small child at your home to which you want to serve some delicious and tasty food? Then simply dry out your home-based foods in Excalibur dehydrators and make some powder of them. You just have to pour some milk as well as water in this powder before serving to the baby. You can dry out the herbs and flowers of your garden in Excalibur food dehydrators. The main benefit you can see that they not only smell good but you can have homemade dried herbs at your home in very less time. While making homemade bread at home, you just have to simply put the bread dough inside the Excalibur dehydrators and rest function will be performed by the appliance. The dough will rise amazingly in the warm, dim interior of the dehydrator. For the people who want to make homemade noodles or pasta, besides buying it from the market, the Excalibur dehydrator works astonishingly. The tray as well as the little heat of the dehydrator dries out these type of food perfectly. Dehydrating the seeds of pumpkin, sunflower, cashews, walnuts, and pecans could be done easily in the Excalibur dehydrators. You do not have to be a professional for using the appliance of this brand. Several people love the ease of dehydrating foods in a good dehydrator, and that's why an Excalibur food can be an important appliance in your home. This dehydrator is an excellent choice if you are planning to stock up some foods for your food store. The Excalibur dehydrators are available in different sizes in the market for domestic use i.e. 4 trays, 5 trays, 6 trays, 9 trays, and 10 trays. If you want to buy this dehydrator for commercial purposes then 12 trays and 42 trays food dehydrators are also available that supports the large quantity requirement in hotels or restaurants. You can also adjust the temperature of your appliance with the help of adjustable thermostat feature. It helps you in selecting the drying temperature of the appliance precisely. This feature also benefits you in drying out ant variety of food i.e. from delicate herbs to hard meat jerky. The maximum number of Excalibur dehydrators also consists of a timer which can be of 26 hours, 48 hours or 99 hours. You can choose the model with the timer which suits you the most. However, if the timer is not your primary concern then you can for Excalibur dehydrators which are without the timer. You can simply and quickly wash the trays of the Excalibur dehydrators in the dishwasher. However, you must check this feature in advance because cheap models may not have this benefit. Some of the Excalibur dehydrators have the technology of Hyperwave™ Fluctuation also. It fluctuates up the temperature to make the surface moisture vaporizes, and for making the inner moisture move to the drier surface, the temperature gets down accordingly. The low temperature keeps the enzymes in the food active and the fast moving air dry the food quickly. In the parallexx horizontal airflow, the fan, thermostat and heating element are located on the back side of the trays dehydrators and over the bottom side of the stackable food dehydrators. The cold air is heated and dispersed uniformly on every single tray. This special design aids in faster drying of food by retaining more nutrients and flavor without any tray rotation. The screens of all Excalibur dehydrator screens are BPA free which means they are not harmful to our body at all even after getting heat up. It is one of the main advantages which you get after buying Excalibur dehydrators. You will save lot of money which you might have to spend in buying food and drying them in bulk. It becomes easier to save and preserve every single vegetable and fruit of your garden with the help of Excalibur dehydrators. The hard food items like fish and meats can be dehydrated quickly in just 4 hours. The dehydration process in Excalibur food dehydrators is much easier and less expensive than the freezing or canning. There is no need to add harmful preservatives and additives in the food which you dry in the Excalibur dehydrators. The kids, as well as your family members, will get healthy alternatives in place of junk food. The Excalibur dehydrators consume very less amount of electricity during the drying process. You can also use the Excalibur dehydrators for making dried flowers, home crafts, and dough formations. Even though the instruction booklet of the dehydrator states that there is no need to do the rotation of the trays, but this might not be true in the case of very juicy fruit, for example, mangoes. The thicker food like banana has more even consistency than another type so fresh fruit. You can use leather sheets for quickly and evenly drying. If your trays are not dishwasher safe, then you must submerge the trays in the water for some time so that the stick dried fruit comes out easily after soaking. It's quite difficult to evenly shape and find the equal thickness of all the fruits and vegetables. Thus, for more easiness, you can use the utensil called ‘mandolin.' But if still your food is unevenly sliced, then you must place the thicker pieces nearby the boundaries of the trays because the middle of the tray dehydrates more gradually. The instruction booklet given along with the Excalibur dehydrators is very comprehensive, but there are some fruits of different countries which are not available in it. Thus, you can take help of internet in such case before making any new recipe. You must always take proper care of the appliance by following all the instructions given in the manual book. It mainly helps in increasing the life of the dehydrator so that it can serve you for several years. You must be wondering that how an Excalibur food dehydrator is superior for the living foods. Well! There are mainly two important features which required for dehydrating living foods by also preserving their enzymes. So, the 1st primary element is the appropriate control of the temperature, and the 2nd one is the time which food needs for dehydrating. If the dehydrator’s temperature is very high, then it can destroy the enzymes of the living food. But if the appliance’s temperature is very low, then the food will take the longer time to dry which might spoil the food or result in the formation of the bacteria. In the Excalibur food dehydrators, the technology of Parallexx Horizontal Airflow system as well as an adjustable thermostat exceptionally suitable for drying raw foods even though holding the maximum food qualities. The feature of adjustable thermostat lets you control the temperature of the air and the fan located at the back side of the Excalibur dehydrator generates the Parallexx horizontal-airflow dehydrating system which offers quick and uniform drying. With the help of these two features, the Excalibur dehydrators can retain the low food temperature for preserving the enzymes and also dries out the food quickly with the faster air flow movement. 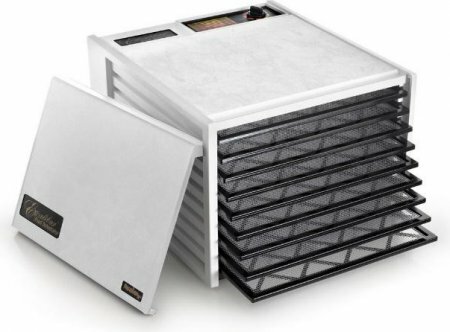 The maximum number of stackable dehydrators is poorly design without any fan or temperature control. Thus, you have to rotate the trays in such case. Do You Know That an Excalibur Food Dehydrator Is the #1 Choice for Small Businesses, Homeowners, Restaurants, and Universities Worldwide? Q: While Using the Drying Trays, I Learned That My One Side Food Gets Dried Before Than the Other. What Must I Do? In your case, I think that your Excalibur dehydrator is drying one side faster than the other. In between the process of dehydration, you can turn the trays to 180 degrees. It will speed up your dehydration process and also reduces the energy consumption of your appliance. Q: My Pears and Apples Get Darkened to Oxidized-brown Color During the Process of Drying. Are These Safe to Eat or I Have to Make the New One? Yes, you can eat that fruit without any worries. Even if your apples have turned to oxidized-brown color but, still they are safer to consume. There are so many fruits that get oxidize throughout the drying procedure. The oxidation of the fruit occurred when the skin of the fruit exposed towards the air. When you pretreat your fruits, the oxidation gets reduced again. Q: Why Must the Ends of My Fruit Leather Get Thicker as Compared to the Center Portion? When you make fruit leathers, the end sides of the mixture get dry pout quickly as it has a tendency to get dry first. However, if the end sides of your mixture are as same thick as the center portion, then it will get dehydrated too rapidly, and in fact, it can become delicate. Q: When I make my fruit leathers in Excalibur dehydrator, it gets fragile and hard. Please suggest me that how can I made them as same as we found in the supermarket stores? The juicy fresh fruits (like strawberries) are in liquefied form which can be turned into thick and hard leather just like we get in the supermarket stores. If you only add a banana while making puree, the mixture will get turn into thick fruit leather quickly. However, you must be sure that you have to pour ¾ - 1 cup of the puree over every single tray and let it get spread out. One thing more you must not forget that the drained puree must be ¼ inches thick from the side of the edges. Q: If I Make Powder of My Dried Vegetables Then, for What Purposes Can I Use Them? Numerous vegetables could be powder like onion and garlic. Obviously, these two are the preferred seasonings that can be used in the sauces or meats. Besides this, you can also powder the tomatoes which could re-form into the tomato sauce, catsup, paste, squash or soup. It is quite easy to make powder of the fruits and vegetables. You just have to blend the dried foods in the grinder and store it in an airtight jar or container. ​Q: How is the customer care team support of the “Excalibur food dehydrators’ company in case of any problem? The response and revert of the customer care team of the Excalibur food dehydrators are quite fast and quick. They always attend the queries of their consumers and try to resolve them as soon as possible. Q: When the Food Items Get Dry in the Excalibur Food Dehydrator, Then What Should Be Done so That It Does Not Get Over-dry? As soon as your dehydration process gets over, you simply have to remove the food item from the trays and pack it in an airtight jar. However, if you find any moist pieces over the trays then keep them inside the dehydrator until they get totally dehydrate. On the other hand, if your Excalibur dehydrator requires rotation of the trays, then you must rotate it to 180 degrees in between the process of dehydration. It will allow you complete drying of the food that can be removed from the appliance altogether. Q: What Type of Information Do We Get in the Manual or Instruction Booklet Which We Get along with the Excalibur Dehydrator? The instruction booklet guides you sensibly that how you should use the appliance and in what ways you can use it in a better way. Some of the books also contain the recipes (such as craft ideas, guidelines for making yogurt and cheese, drying grains and even preparing baby food) of the dried food that you can make at your home. Q: How Much Warranty Period Is Offered by the Manufacturers on the Excalibur Food Dehydrators? Well! The manufacturers usually provided 1 to 10 years of warranty period to the buyers. But this time varies with product to product. At last, we want to say that any person who have to buy an Excalibur food dehydrator model could not deny the benefits which he or she get in return for sure. The Excalibur Company is one of the most prominent names in the world of "food dehydrators,” and it has built its reputation by offering the best quality featured product to its buyers. In the above article, we have reviewed the top ten best Excalibur food dehydrators along with their pros and cons. It will mainly help you in taking the decision regarding the purchase of an Excalibur food dehydrator. We know that the health of a person is the top priority in everyone's life these days and if you buy any of the above products, you will surely get a good companion in your healthy lifestyle for the longer period. We are assured that whatever model of the Excalibur dehydrator you choose; you will get a good yield in the end. The primary purpose of the company is to satisfy their clients completely with their products so that they can recommend them to other people as well. So, what are you waiting for? Go and get an Excalibur food dehydrator for yourself and you can even gift it to your closed ones. All these products are readily available on the online shopping website i.e. www.amazon.com at very decent price.